Home from your early morning (or middle of the night) black friday shopping? Or did you sleep in because you know you can find everything you want online? Well, I rounded up a list of all my favorite shops and their specials this year, so here you go! 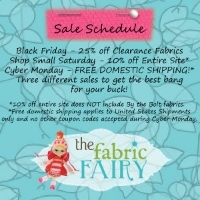 At the Fabric Fairy, Black Friday will be 25% off all Clearance Fabrics, Shop Small Saturday will be 10% off the entire site* (excludes wholesale), and Cyber Monday will be FREE DOMESTIC SHIPPING* (Domestic United States shipments only; no other coupon codes accepted including the Returning Customer Coupon Code). Use promo code 'BLACK' at Thermowebonline.com this weekend for 30% off and Free Shipping on orders over $25. There are all kinds of sales going on at Peek-a-Boo Pattern Shop! Buy 1-4 patterns and save 25% with coupon code 'Jolly25'. Buy 5 or more patterns and save 40% with coupon code 'Jolly40'. 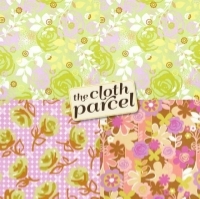 At the Cloth Parcel, patterns will be 50% off on Friday and Saturday with coupon code "blackfriday". On Cyber Monday, all FreeSpirit fabrics will be marked down 30% off, no coupon needed. During both of these promotions, all orders over $50 automatically qualify for a free Lavishea lotion bar ($8 value). Laminates.etsy.com is offering free shipping (domestic only) on Cyber Monday only with any purchase over $25.00 . Use coupon code FREESHIPOVER25. 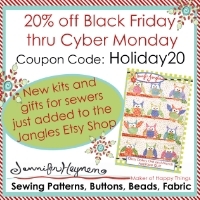 Jennifer Heynen (aka Jennifer Jangles) is giving you 20% off all weekend long in her etsy shop and website too. Use coupon code 'Holiday20'. 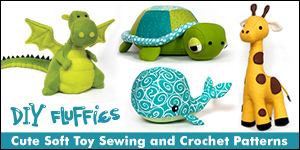 Fishsticks Designs is releasing three new patterns on Cyber Monday, just in time for Christmas sewing! Read all about them on the Fishsticks Blog at www.fishsticksdesigns.com/blog . All PDF and paper patterns will be discounted in the main pattern store by 25% -- no code needed -- on Monday, December 2nd only: www.fishsticksdesigns.com/patterns ! In addition, use the code "Buy4Get1" to get one free pattern when you purchase 4 of equal or greater value. 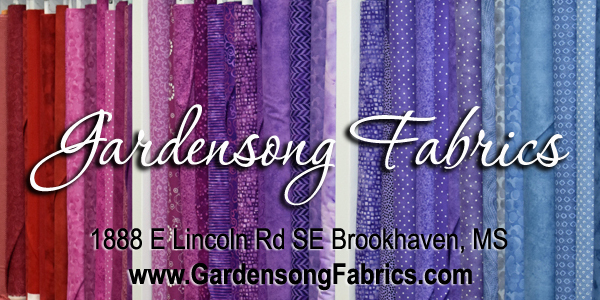 Visit Lemon Tree Fabrics for $1 off all regularly priced fabrics Friday through Monday! and Free shipping on all US orders over $50! Fat Quarter Shop has 25% off SITEWIDE for 2 days only! No code necessary! Sale ends Saturday November 3, 2013 at midnight CST. Not combinable with any other offer and is not applicable to clubs, programs or the purchase of gift certificates. Visit Fabricworm for lots of sales plus an additional 10% off with coupon code 'BFOMG'. My favorite place to learn new things is having a huge sale on their classes! 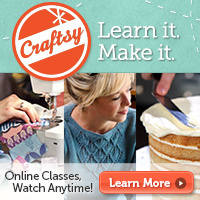 All Craftsy online classes are on sale for $19.99 or less. With classes priced up to 66% off, now is a great time to get the classes you've been eyeing all year! You can also give them as gifts. 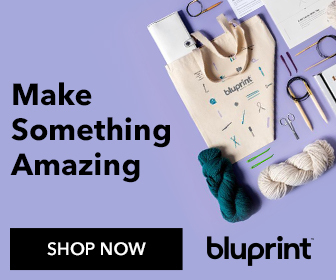 $5 Deals - Over 100 patterns to choose from for just $5! Michael Levine Fabrics (www.lowpricefabric.com) has their entire shop 20% off. Use code 'Turkey2013'. Last but not least, take 20% off your entire order from the SewCanShe Shop with coupon code 'HappyHolidays'. Shipping on any U.S. order is still just $1.95! Offer good through Sunday night. Hope you all have a wonderful day and still have time to sew a bit!